This chicken parmesan is my love letter to the Italian-American red sauce classic everyone craves. 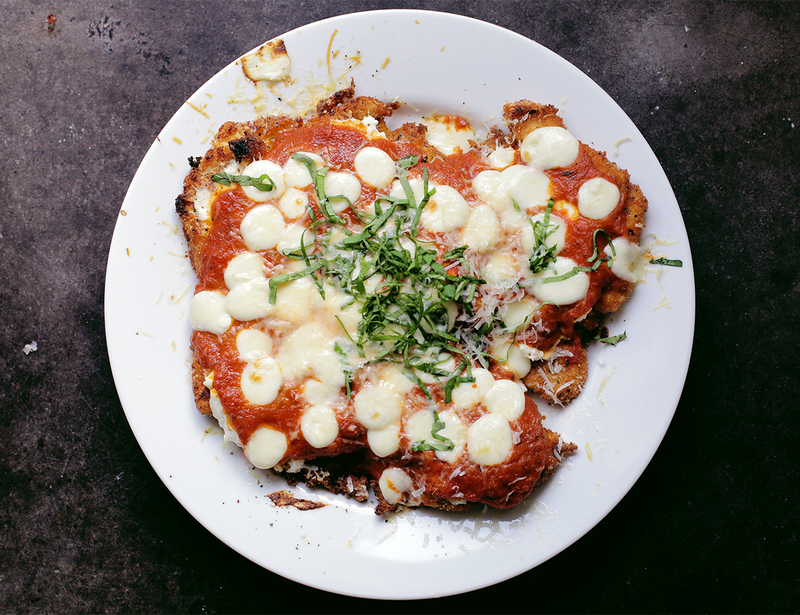 Sure you can gussy it up, but this recipe sticks to the basics—fried chicken topped with an easy homemade tomato sauce, creamy ricotta, mozzarella melted under the broiler, and a touch of fresh basil. It’s truly a dinner of champions. First, make the tomato sauce. In a large saucepan, heat the olive oil until shimmering. Add the garlic, onion, basil, a pinch of chile flake and oregano. Cook over medium heat for 3 minutes. Add the wine and cook for 1 minute. Season with salt and sugar. Add the tomato paste and tomato puree. Stir to combine and simmer over moderately low heat for 20 minutes. Taste the sauce and season with salt and pepper as needed. Reserve. Place the chicken breasts one at a time between sheets of wax paper or plastic wrap. Drizzle the olive oil over the chicken and then pound out with a mallet until the breasts are about 1/4-inch thick. Season with salt and pepper. In one bowl, combine the breadcrumbs with the parmesan cheese. Place the seasoned flour and beaten eggs in separate bowls to make a breading station. Dredge each chicken breast in the seasoned flour, dip in the beaten egg and then dredge in the breadcrumb cheese mixture. Set aside. Heat the oil in a 14-inch skillet over medium heat to 375 degrees F. One at a time, fry the chicken pieces until cooked through and golden brown, about 4 minutes per side. Place both fried chicken cutlets on a baking tray, smear with the ricotta, top with some tomato sauce, and season as needed. Cover with the mozzarella cheese and broil until cheese is bubbling and starting to brown. Serve immediately, garnishing with fresh basil.